Above: Professor John Kudlac, left, with MSES students Chasidy Zubler, Monica Nogueira and Dustin Miller at the program's graduate seminar, during which each student presented a research report. Below: Nogueira gives her presentation. This August and December, the first class of students is graduating from Point Park's new Master of Science in environmental studies program, which began at the University in August of 2009. Unique to the Pittsburgh area, the MSES program offers an interdisciplinary approach in an accelerated format that allows students to complete the program in one year. MSES student Monica Nogueira is a content acquisition manager at SAE International and has bachelor's degrees in journalism and public relations, plus master's degrees in business administration and international business management. She enrolled in the MSES program last August to enhance her skill set and expand her knowledge of environmental science relative to the mobility industry. "Ultimately my goal was to become more involved in the sustainability arena as it relates to corporate responsibility," said Nogueira. "I fell in love with the program. It helps those who are interested in expanding their knowledge in a way that is so multidisciplinary that it is useful in just about anything you want to do that touches environmental issues." Nogueira will graduate this December. 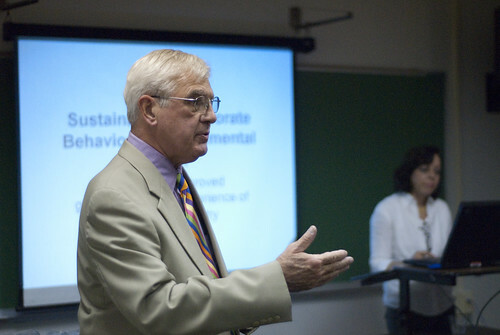 "The MSES program encompasses economics, environmental science, political science, environmental law, environmental ethics, environmental communication, and environmental health so that the students can get a complete view of the various entities that are involved in trying to solve environmental problems," said John Kudlac, professor of earth sciences and engineering technology and director of the MSES program. "Our students come from a wide variety of backgrounds - from the sciences to business to engineering -- enabling students to learn from one another." MSES student Chasidy Zubler earned bachelor's degrees in political science and environmental studies from the University of Pittsburgh. With aspirations for a career in environmental law, Zubler said she chose the MSES program to get a deeper understanding of the environmental issues that her career will require. She hopes to continue her studies in law following her graduation from Point Park. "I liked the smaller size of the program," said Zubler. "I got to know a lot of my professors a lot better than I did during my undergraduate studies." Through her studies at Point Park, Zubler became involved with the Ecological Society of America, which held its annual conference in Pittsburgh in early August. She was instrumental in the organization of more than 100 student volunteers who assisted with the conference. That work allowed Zubler to network with environmental researchers from around the world who were presenting about issues related to global warming. "There was huge variety of information that was presented at the conference that I found personally very interesting. The conference gave me a deeper understanding of the environmental issues that we face as a society in the future," she explained. Admission to the MSES program requires a bachelor's degree in any discipline from an accredited institution and a minimum of nine credits of previous science course work, either as part of -- or addition to -- the bachelor's degree. "Students can complete the program in either a one-year or two-year accelerated format," said Emily Quidetto, admissions counselor for graduate and adult enrollment. "The courses are evening-based classes, designed to accommodate the working professional."